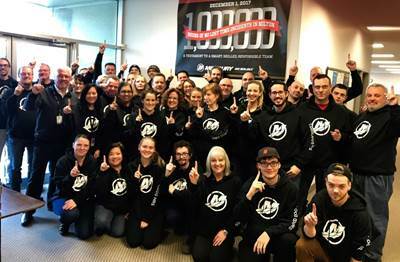 Mercury Marine Canada is celebrating a major milestone at its Milton, Ontario plant, reporting one million hours of no lost time injury. Milton, which is Mercury’s headquarters in Canada, has been injury-free since 2010. The plant has 58 employees and houses corporate functions such as finance, sales, marketing, service and is home to Mercury finished goods, P&A and Land ‘N’ Sea Canada. “Building and maintaining a culture of safety as well as attention to detail has been the key to our success as a business unit here in Milton” says Georges Jalbert, General Manager. Mercury Canada continues to be led by the good work of their joint health and safety committee, a cornerstone for the plant in its continuous improvement journey and safety culture. Through assessments, evaluations, inspections, training and strategic initiatives, Mercury Canada can ensure that all employees are actively engaged in safety practices.